Recently, however, developments in genetic science and population biology have enabled Darwinian biological theory to be extended logically to show that human society exists not as a collection of selfish individuals with selfish genes, but as a collection of selfish groups with selfish gene pools. Genetically controlled behavior is increasingly recognized to be conditioned not only by its effect on the fitness of the individual, but also by its effect on the inclusive fitness of the genetic kinship group. 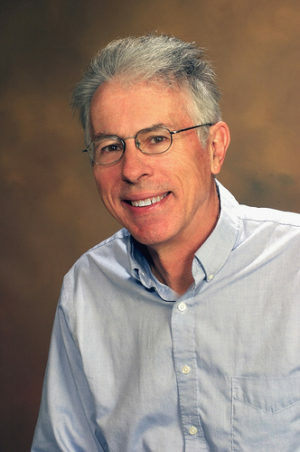 Thus, using fresh scientific evidence academics such as J. Phillipe Rushton at Western Ontario University have taken the lead in showing that human behavior can be properly understood only by recognizing the existence in the world of genetically different human racial groups, analogous to separate species, which live and act in direct competition with each other. 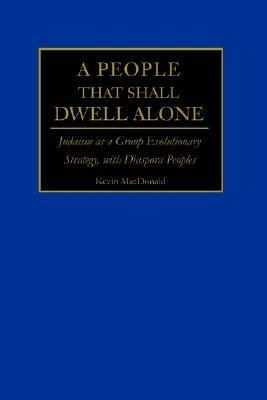 Kevin MacDonald’s book A People That Shall Dwell Alone: Judaism as a Group Evolutionary Strategy (Praeger, 1994) extends this approach into the most controversial of areas by putting forward a convincing explanation for the existence and survival of the Jews from the perspective of modern social and biological science. Most previous accounts of Jewish history must be dismissed as being distorted by extreme subjectivity. MacDonald’s book in contrast stands, in both intent and effect, as a successor to the late-19th-century effort of writers such as Houston Stewart Chamberlain to develop a Wissenschaft des Judentums (“Jewish Studies” or “Judaic Studies” in German). MacDonald’s major theme is that Judaism as a religion has never existed as an end in itself and that the Jews are much more than a religious group. He shows that Judaism was formulated as a weapon in a Jewish biological survival strategy which aimed to ensure the segregation of the Jewish gene pool from those of surrounding Gentile societies. This thesis, he asserts, is suggested by the substantial evidence from modern studies revealing the major genetic differences which exist today between Jewish and Gentile populations. These show that Jews have not only remained genetically distinct from the groups which they have lived among for centuries, but that Jewish populations in widely separated areas have significantly more genetic commonality than they have with their respective Gentile host populations. Eastern European Jews, for example, are far more genetically similar to North African and Middle Eastern Jews than to non-Jewish eastern Europeans, while Jews in Russia are six times more genetically distinct from Russians than Russians are from Germans. MacDonald also reveals that although there are some slight differences between Ashkenazic (eastern European) and Sephardic (Mediterranean) Jews, all the Jewish populations of the world essentially constitute a single genetic population. 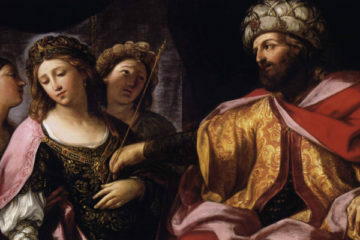 The ferocity of the racial hatred which Jews have traditionally directed toward Gentiles thus has the evolutionary purpose of maintaining the separateness of the Jewish gene pool. This has been manifested in a variety of cultural practices, religious beliefs, mannerisms, and occupational peculiarities. And it has resulted in definite psychological and physical differences between Jews and Gentiles. The physical ideal for the Jewish adult, for example, was to be thin and pale; children were even scolded if they developed a physically strong, ruddy appearance. The Jews’ genetic evolutionary strategy also accounts for the importance of kin-based cooperation and in-group altruism within Judaism which has been crucial not just in maintaining Jewish cohesion, but in leading to intense resource competition and hostility against Gentiles. In seeking to support this argument, MacDonald quotes figures which highlight the highly disproportionate influence of Jews in areas such as retail, law, banking, and the media in pre-1933 German society. In Berlin in 1930, 80% of theater directors were Jews, and Jews wrote 75% of the plays produced in these theaters, while they also edited the leading newspapers and were over-represented among journalists. MacDonald’s implication from this is clear: in seeking to implement their group evolutionary strategy Jews have chosen to engage in certain activities and occupations which have naturally involved the exploitation of the non-Jewish population. This, in turn, has usually resulted in a natural, defensive reaction on the part of Gentile society. Jews themselves, therefore, have been responsible for developing “anti-Semitism,” which, in fact, already exists in the Jews’ imagination long before it exists in the hearts and minds of their Gentile hosts. MacDonald’s main hypothesis is actually confirmed by another recent book on Jewish history, which, superficially at least, deals with the subject from a very different perspective. Written by Rabbi Dan Cohn-Sherbok, The Crucified Jew: Twenty Centuries of Christian Anti-Semitism (Harper Collins, 1992) provides us with a specific example of Judaism as a group evolutionary strategy, and an obvious example of what MacDonald refers to as the extreme subjectivity of existing Jewish histories. The declared aim of Cohn-Sherbok’s book is to highlight two millennia of “underlying Christian hostility to Judaism and the Jewish people,” although it is clear that for “Christian” anti-Semitism, what is really meant is White anti-Semitism. Indeed, the first chapter is devoted to the pagan anti-Semitism of the ancient Greeks, and this then follows through the National Socialist period in Germany and up to the present day. The book is a typical Jewish propaganda piece, full of half-truths and blatant distortions. It tells the same old, worn-out story of the poor, innocent Jews being picked on and persecuted by the nasty Gentiles in various countries for no other reason than they just happened to be poor, innocent Jews. Whether describing their expulsion by the English in 1290, the Germans in 1298, the French in 1306, the Lithuanians in 1395, the Austrians in 1421, the Spanish in 1492, or the Portuguese in 1497, Cohn-Sherbok displays not a whiff of objectivity, humility, or self-criticism. There is just one absolute truth: the Gentiles were wrong and evil, the Jews right and good. With MacDonald’s theory in mind, however, such extreme Jewish subjectivity appears perfectly natural and logical. The Jews really believe that this is the truth because it is their truth, and the only one that matters from their own evolutionary perspective. In this sense, Cohn-Sherbok’s The Crucified Jew can be seen to be primarily aimed at his fellow Jews, with the intention of countering any tendency which they might have to get along with their Gentile hosts by reciting all the past wrongs the Gentile world supposedly has inflicted upon them. According to Cohn-Sherbok, all Gentiles, regardless of nationality or religion, hate Jews. Jews, therefore, must unite together and isolate themselves as a method of self-preservation. This further establishes the fact that the endless series of persecution cycles, which has been the outstanding feature of Jewish history, has actually been essential for Jewish survival and incited by them for that very reason. Cohn-Sherbok admits, for example, that the Roman destruction of Jerusalem and the Temple actually proved beneficial in enabling the Pharisees to create a framework for Jewish survival in the Diaspora. This freed the Jews from previous institutions and political boundaries and enabled them to become a universal people with a transportable heritage. And, of course, the experience also provided them with another useful, unifying grudge against the Gentile world. Using MacDonald’s theory, we see how this consistent process of Jew-inspired “anti-Semitism” has actually served the Jews doubly well. Not only has it been invaluable in maintaining the Jewish racial consciousness and preventing genetic assimilation, but it has actually served a definite eugenic purpose by regularly eradicating from the Jewish stock the least fit individuals: that is, the ones who get caught by the enraged Gentiles, while the smarter and quicker ones get away. MacDonald confirms that the Jews have been long-standing and committed practitioners of racial purity through eugenics, and that they have practiced discrimination against poorer and less fit Jews “as a function of genetic distance,” particularly in times of economic and demographic crisis. Intriguingly, he also suggests that Jewish eugenic practices have extended to Jews “stealing” selected genes from Gentiles. These genes are then submerged into the Jewish gene pool, so strengthening the Jewish genetic stock. Just as alarming, MacDonald raises the possibility that Jews also have evolved certain genes which have naturally promoted phenotypic similarity with the host Gentile population. This effect, he believes, could have been amplified via natural selection within Jewish populations without affecting the large overall genetic distance between Jewish and Gentile gene pools. Just as distinct species of butterflies can adapt themselves to resemble each other, so Jewish sexual selection behavior ensures some physical resemblance with the host population, such as in eye and hair color. In effect, this amounts to genetic deception tactics as part of the Jewish evolutionary survival mechanism. This factor is also reflected in the nature of Jewish intelligence. Jewish children’s verbal IQ is considerably higher than their performance IQ, with visual-spatial reasoning being greater among Gentile children, especially those of northern European ancestry. This would again suggest an evolutionary preoccupation with outward display, which, as MacDonald points out, is reflected in the lack of Jewish original thinkers and inventors. Jewish economic activity has tended not to be characterized by technological innovation related to mechanical abilities, but by economic “mediation” in the form of importing and exporting goods, and by commercial flair. In 19th-century Germany, for example, the inventors of new technology — such as Rudolf Diesel and Werner von Siemens — were predominantly Gentiles, while several Jewish fortunes in technical areas — such as those of Ludwig Loewe and Emil Rathenau — were made by importing technology that originated elsewhere and were dependent on capitalization provided by Jewish private banks. And, of course, a preoccupation with outward display is certainly reflected in the traditional Jewish tactic of deception. MacDonald notes that Jews retained their genetic and cultural separateness for centuries while living a double life as crypto-Jews in Spain, Portugal, and parts of Hispanic America, and that after the Enlightenment Jews were effectively living double lives, outwardly giving loyalty to a particular state, while privately retaining loyalty only to their race. This thesis is supported by Cohn-Sherbok in The Crucified Jew. He admits that Jews have consistently pretended to be Christian or different from other Jews while secretly remaining Jews and retaining loyalty only to the Jewish race in order to gain advantages over the Gentile population. He confirms that a considerable number of Jews in Europe adopted the Christian faith purely to secure social and professional advancement. The poet Heinrich Heine (1826-1884), for example, converted from Judaism purely to register as a Hamburg lawyer and to gain an “admission ticket to European culture.” Benjamin Disraeli, Queen Victoria’s baptized Jewish prime minister, is also cited as another successful example of a Jew superficially becoming part of Gentile society to achieve certain benefits, while secretly remaining a Jew. Such realities may help us realize that when some Jews profess to be on our side and in apparent opposition to other Jews on issues such as gun control, they may very well be just employing the deception tactics which are natural to the evolutionary survival of their race. So when judging Jews — all Jews — we should pay less attention to what they say and more to what they do. We should stop trying to puzzle out their motives as individuals and should judge them on the basis of the effect which their presence as a group has had on us as a people. Significantly, this is something which MacDonald himself refrains from doing. Apart from some tantalizing hints (for example, his note that Jews long have been disproportionately involved in destructive economic activity, such as bank failures, large-scale fraud, and stock market panics, which have resulted in the massive transfer of wealth from the Gentile community to the Jewish community) he completely ignores the other major pillar of the Jews’ group evolutionary strategy: namely, the purposeful disruption of Gentile society. 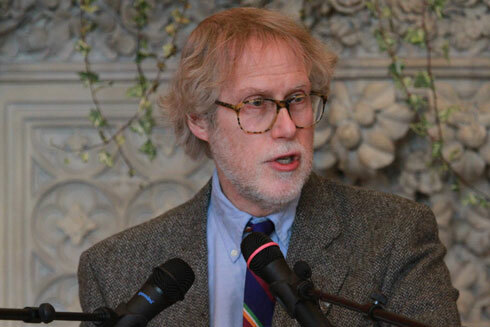 While MacDonald cites statistics to highlight the current “Jewish over-representation” in all sections of the U.S. news and entertainment media and notes that American Jews have a cultural and intellectual influence far beyond their numbers, he makes no attempt to point out how the Jews have used their influence in these spheres to corrupt and weaken Gentile America. The group evolutionary strategy of the Jews, unlike like that of other exclusivist groups — the Amish people, say — has never been based merely on a desire to be racially separate and genetically distinct. It also has been based consistently upon a fanatical determination to deny the same things to non-Jews, along with a compulsion to corrupt and undermine Gentile societies. Cohn-Sherbok’s The Crucified Jew, is in a sense more balanced than MacDonald’s book, in that it displays both pillars of the Jews’ evolutionary strategy: it deliberately incites anti-Gentilism in its Jewish readers, and at the same time with its pernicious lies and subterfuge attempts to induce guilt in Gentile readers and undermine their natural biological defense mechanisms. 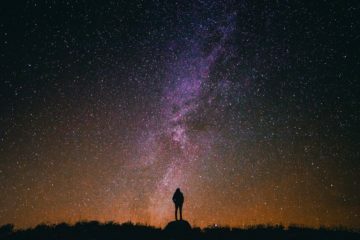 Nevertheless, A People That Shall Dwell Alone: Judaism as a Group Evolutionary Strategy is an extremely significant book, which gives us an essential understanding of the Jewish race from a modern scientific perspective. Both it and The Crucified Jew, in fact, provide us with supremely important lessons on the fundamentals of racial survival. 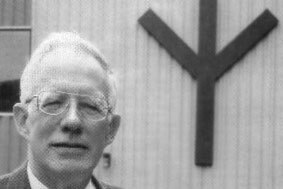 MacDonald states quite bluntly that the reason that European peoples such as the Greeks and Romans perished through genetic mixing was because, unlike the Jews, they did not consistently practice either racial exclusivity or genocide against racially alien populations. Cohn-Sherbok unintentionally reminds us that a race eternally at war with the rest of the world has a distinct survival advantage over those races with an attitude of live and let live. We certainly don’t have to think and behave exactly like Jews in order to survive in this rapidly darkening world, but we had better at least understand how the Jews think and behave, draw the proper conclusions from our understanding, and change our own ways accordingly.